Contour Products Folding Wedge Pillow, Beige, 7"
OPTIMAL INCLINE FOR ACID REFLUX RELIEF - The Contour Products Mattress Genie Incline Sleep System (ISS) is a full support bed wedge solution that elevates your mattress while providing unparalleled support and comfort for your entire torso and hips. Designed to incline the head of your mattress 6-8", which is the recommend height to help alleviate symptoms and provide relief for those suffering from acid reflux, GERD and heartburn symptoms. GRADUAL INCLINE PROVIDES ORTHOPEDIC SUPPORT AND COMFORT - The elongated 48" length inflatable bed wedge provides support for your entire torso and hips. Unlike traditional foam wedges, the force you to bed putting pressure on your back and hips, the Mattress Genies gradual incline provides you the comfort and support you need. The gradual incline of the Mattress Genie ISS prevents you from sliding down on your mattress, which and gently elevates your body, providing you with ultimate comfort. 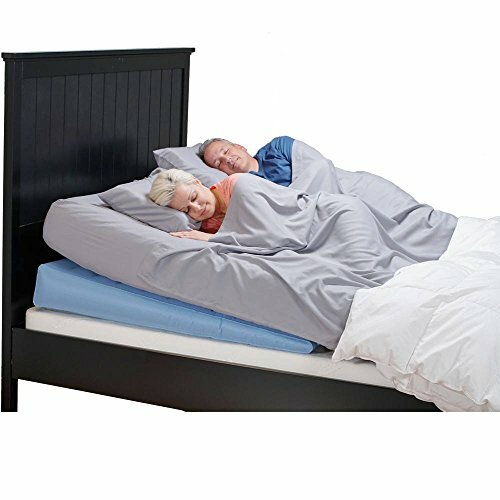 BEST BED WEDGE FOR BACK OR SIDE SLEEPERS - While traditional foam wedges are shorter in length, they do not accommodate side sleepers who are looking to for relief from acid reflux. Since you use the wedge under your mattress, there is no uncomfortable hard foam wedges to lay on and get acclimated to. The longer length slope provides a gradual incline making it a comfortable acid reflux bed wedge for side sleepers too! WORKS ON ALL MATTRESSES - The Mattress Genie ISS is designed to work with all mattress types, styles, brand and foundations (excluding water beds). The Mattress Genie inflatable bed wedge pillow can withstand up to 1000lbs of pressure. So you and your mattress are fully supported and stable throughout the night. Providing comfort all night long for your acid reflux symptoms. AFFORDABLE ALTERNATIVE TO ADJUSTABLE BEDS - The Contour Products Mattress Genie line provides it users with exceptional comfort and support without having to spend 1000's of dollars on an expensive hospital bed or adjustable bed. Whether you are using it to relieve and comfort various health conditions, relaxation while watching TV or reading in bed! If you have any questions about this product by Contour Products, contact us by completing and submitting the form below. If you are looking for a specif part number, please include it with your message.